Sometimes in the winter months as I close my eyes at night, I relax by doing some imaginary gardening. I picture my yard, lush and green. I dream of the new ways I will plant vegetables in the spring and how I will renovate the flowerbeds, dividing and adding new perennials. For years I have dreamed of changing the grass along th e street-side of the fence. It runs half the length of our property and is really only a small sliver of earth. Not only does it seem plain and dull, but the grass is forever creeping under the fence and into my garden beds on the other side. I hate that. 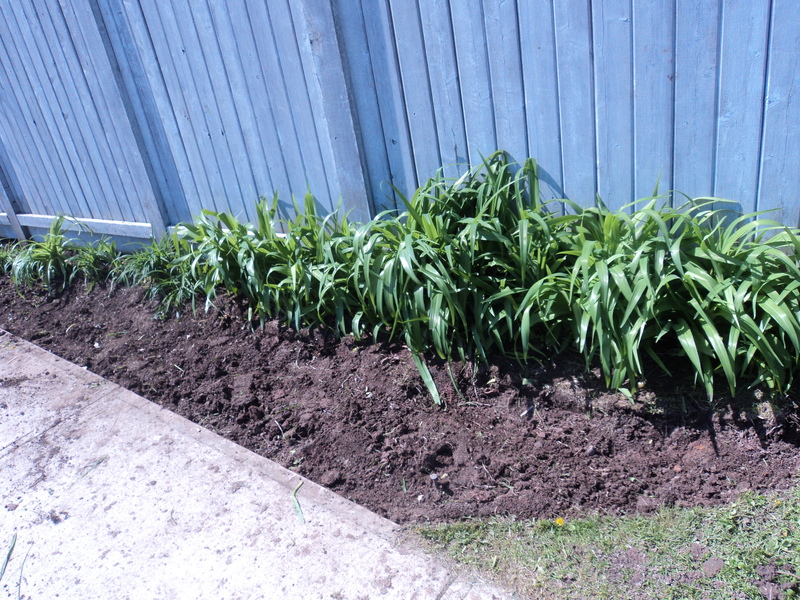 Many times in my mind’s eye, I have removed the sod and put in daylilies. Nothing else–just hardy, orange daylilies that will look nice but need almost no attention. 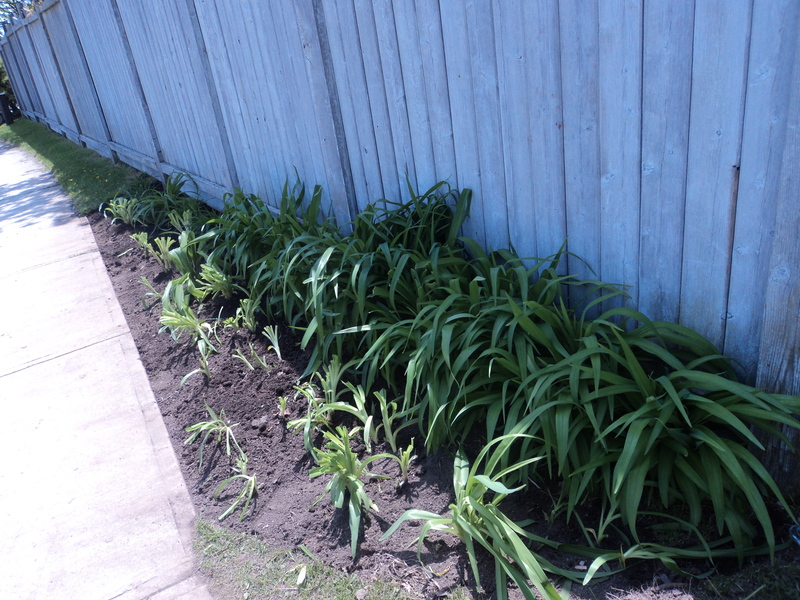 A few years back, I even went so far as to put a few daylilies at one end. I had nowhere else to put them at the time and thought that it might inspire me to carry on and tackle the job. It didn’t. Today, however, I decided it was time to make my dream come true. 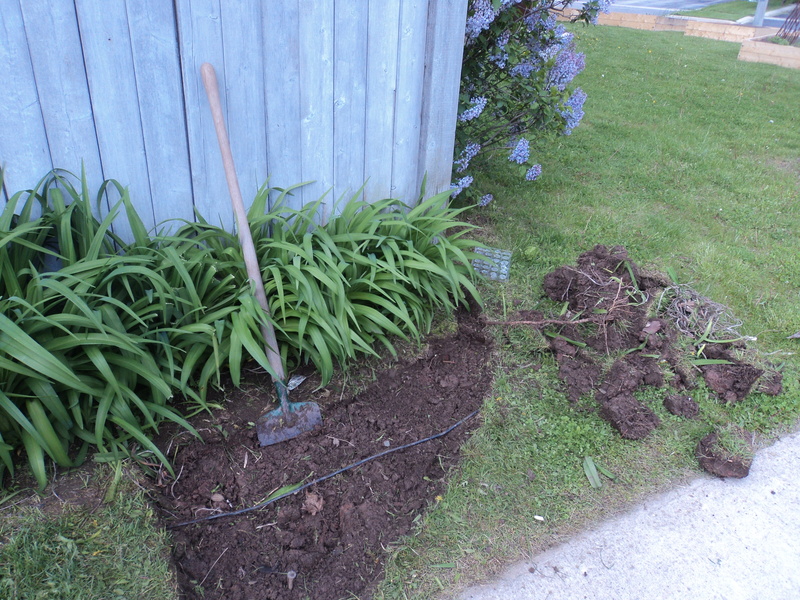 At 9:00, with everyone safely off to work and school, I set to removing the grass piece by piece. 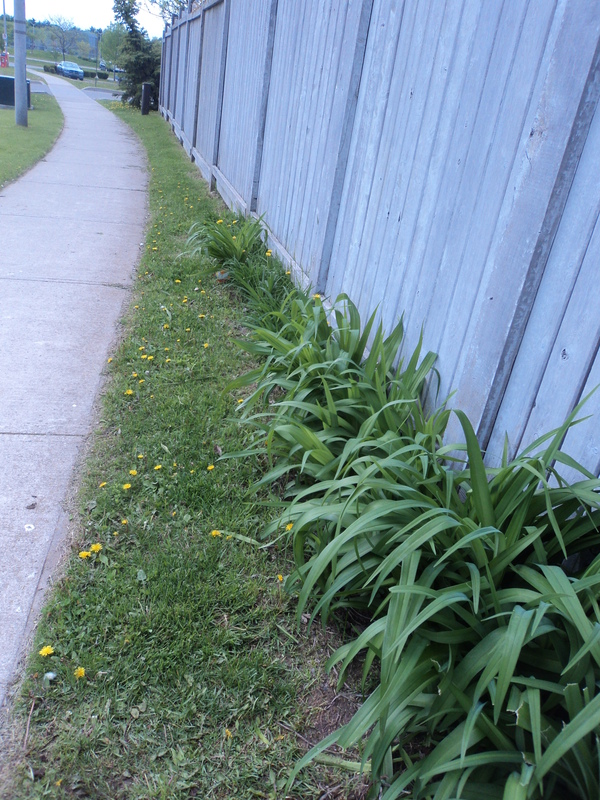 I used an edger to section off long strips and found that the grass came away without too much trouble, especially where the grass met the sidewalk. I piled the chunks on the lawn. Still, the clay was heavy and I decided that I would only work to halfway down the fence. Once the grass was gone, and the stones deposited near one of our two newly-installed rainbarrels, I was ready to plant. Pat had already brought home some pots of daylilies rescued from the church parking lot where they had crept out into the asphalt, and I divided an enormous stand of them in the backyard. I used the extra soil from our vegetable beds, moving it by small wheelbarrow loads since the tire seemed to be a little flat. I gave all the plants a haircut, trimming off their bent leaves and hopefully helping them settle into their new home a little faster. It will take a while for the bed to fill in and look nice–although perhaps I will add some cedar mulch in the next few days to make it a little tidier. I finished the last of the planting and swept the sidewalk at 1:00 (whew!). And that’s when it occurred to me: my dream was alot less work when I was tucked into bed on a cold winter night, far from any actual soil or daylilies. When I imagined the digging and pulling and planting, it didn’t make me sweaty or filthy (notice I am not in any of the photos?). I conveniently forgot how heavy the clay soil can be and how long that strip of grass really is. I am glad that I decided to only do half of the job today–I will need a hot bath and some Advil as it is. The rest will have to wait for another day. Making dreams come true is hard work. This entry was posted in Uncategorized and tagged gardening, inspiration, nature. Bookmark the permalink. I have been wanting to tell you that I’m so glad you are finally taking a sabbatical! You sure deserve it and what a neat subject! I am reading this blog for the first time tonight and enjoying it very much. Seeing what you’ve been doing has inspired us to start our own tiny garden with 14 plants only. The boys are excited to watch stuff and love watering it. It hasn’t needed any water this year so far of course! We really don’t know what we are doing. How exciting to have started your first garden! The boys will love watering even more when the weather gets hot–mine always manage to drench themselves ‘by accident’! I will have to come by sometime–I bet you have some really lovely stories in your garden.